I’m back today with my Décor Enthusiast girls sharing all things outdoors for this month’s décor challenge! I am sharing my outdoor space in the front of my house, since I needed to get it in gear for Spring anyway! I’ve included a few affiliate links so you can find the products I use. 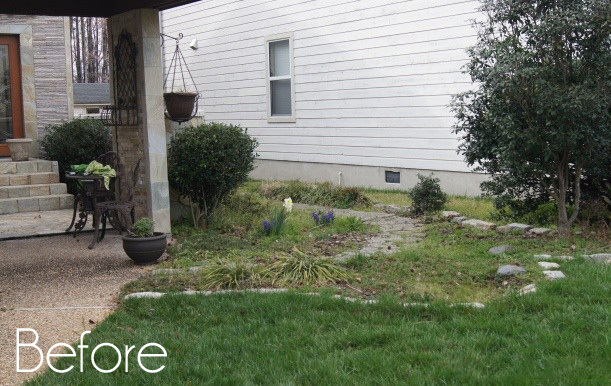 About five years ago, we totally redid our front yard space. 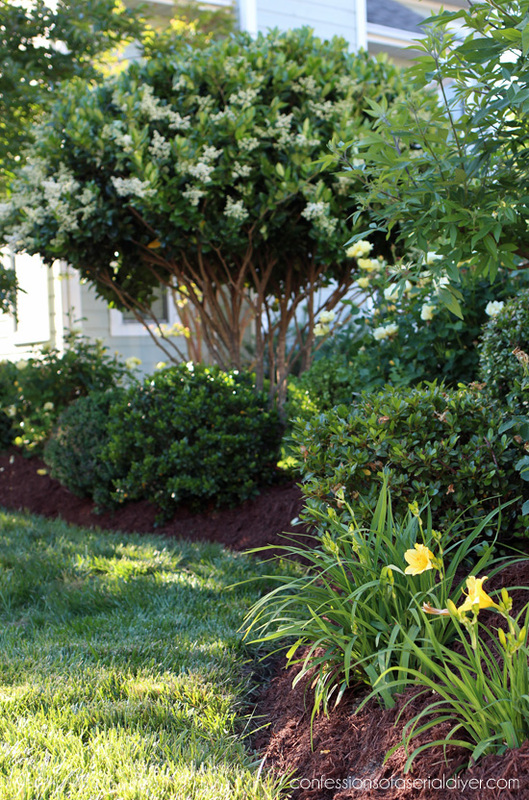 Nothing like freshly mulched beds! 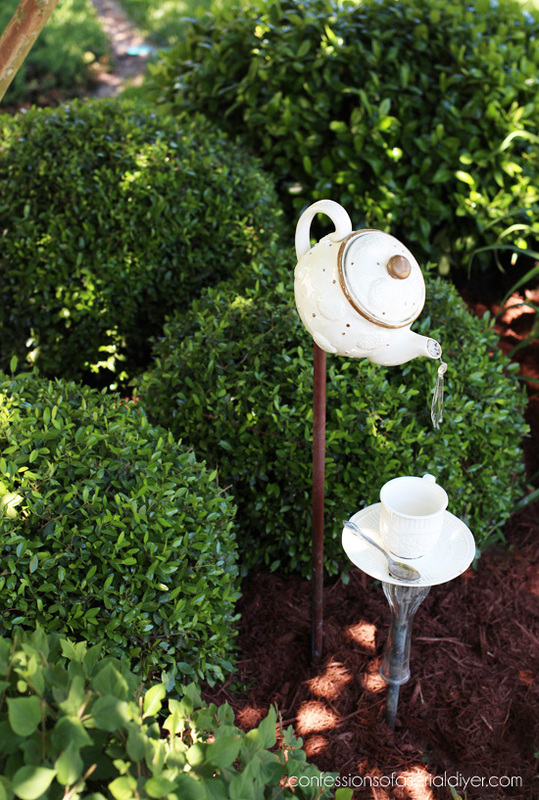 Remember this teapot garden feature? I shared how to make one HERE. It would make a perfect Mother’s Day gift! 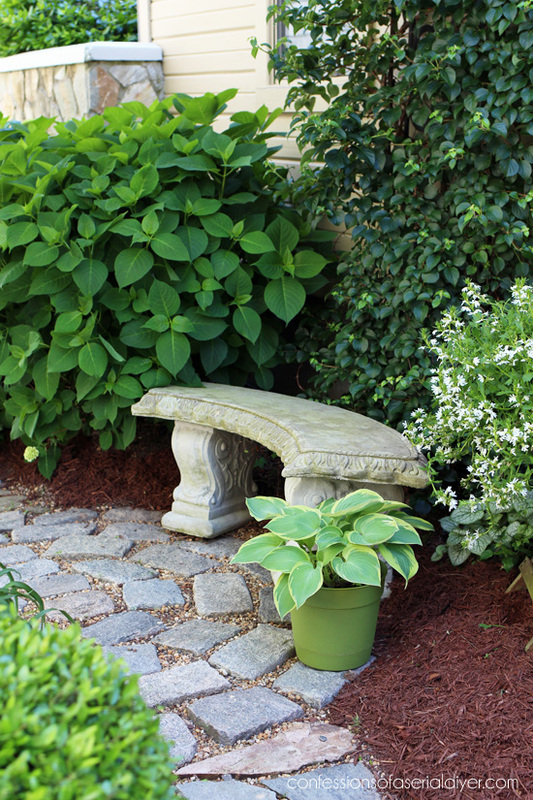 When I was creating my outdoor spaces, I didn’t want just landscaping, I wanted a garden. It can be a lot of work to keep it up, but very rewarding too. I love when it all starts to come to life in the Spring. 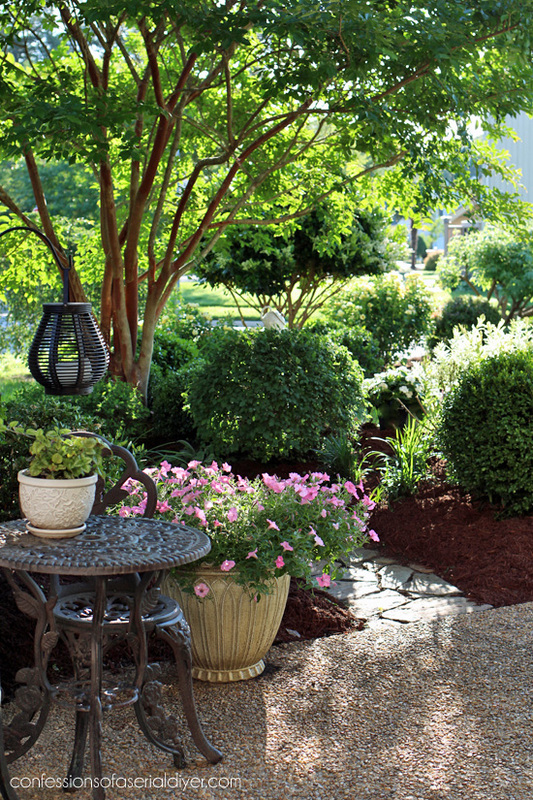 Looking to design a landscape of your own? Check out my post, How to Create a Landscape from Scratch HERE. Just behind the tree is a pathway that leads to the back yard. 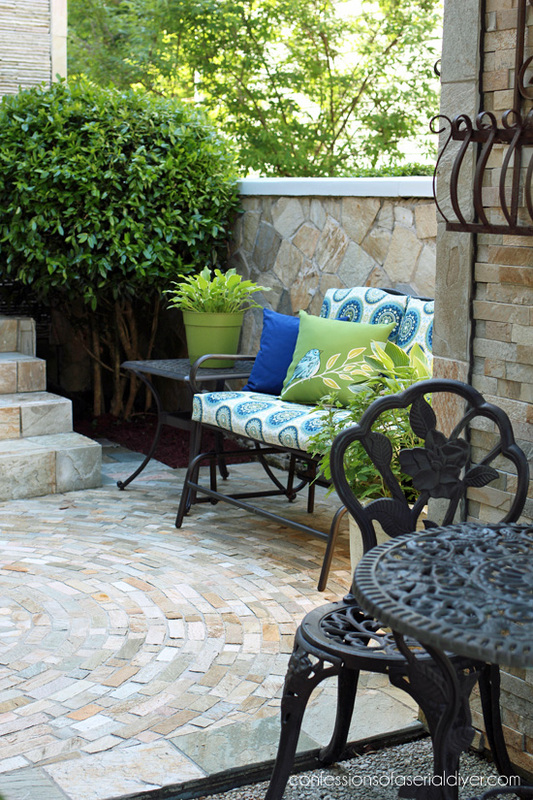 That circular patio area was made out of old granite blocks I recycled from the old landscaping. See how I made it HERE. Those were the old granite blocks I reused for the circular patio above, and we just had a gumball tree removed that was blocking the gate. Isn’t that iron insert in the gate pretty?? 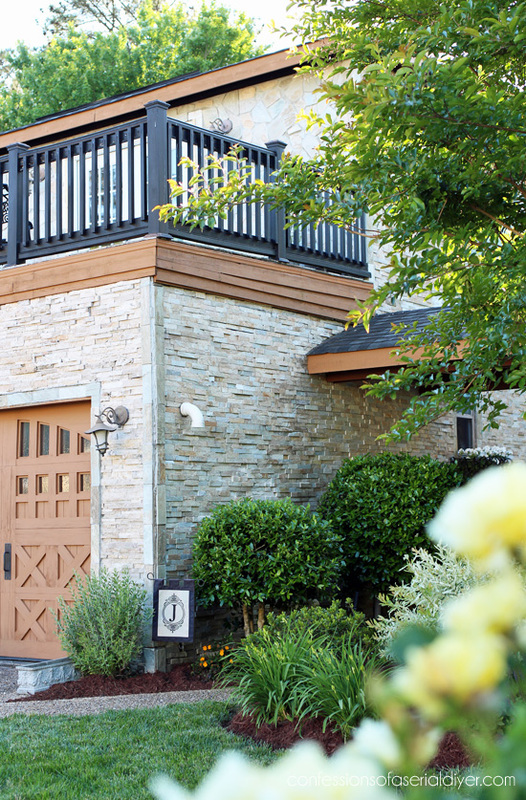 See how I built this gate to accommodate the insert HERE. You can find the iron insert HERE. See the makeover of this glider including the link to how to cover those cushions super easily HERE. To the left is our front door. I found this wreath at Michaels on sale for 50% off. I figured at $25, I couldn’t buy the materials to make it for that. I don’t usually find wreaths I like at Michaels and I like making my own anyway, but I love how colorful and fun this one is. 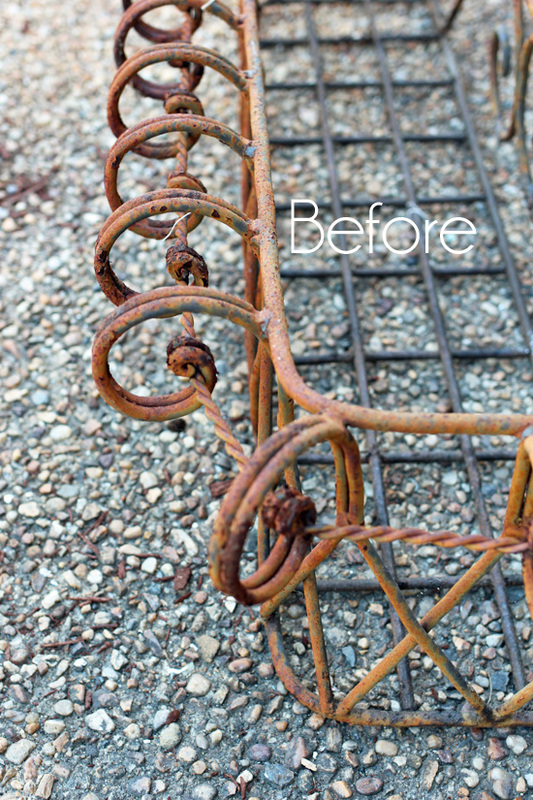 A wire brush to remove all the flaking rusty pieces, and Rustoleum Oil Rubbed Bronze spray paint revived them perfectly! And remember my hanging plant stand I made last year? It was really simple! See the how-to HERE. 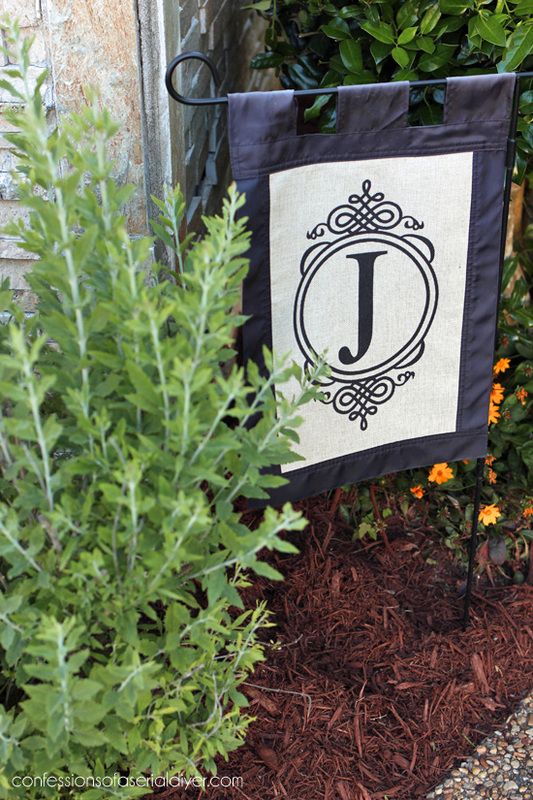 It would also be great with hangers on all four sides to use for wet towels if you had a pool! 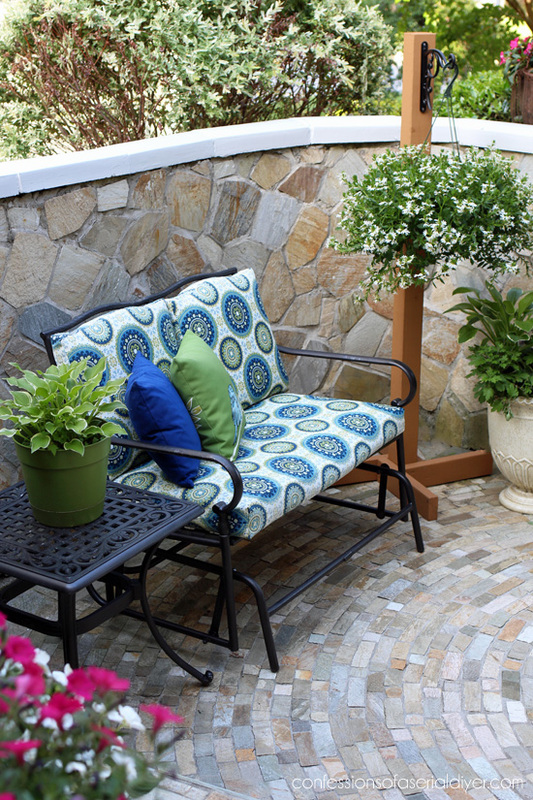 I hope you enjoyed this peek at my outdoor space! 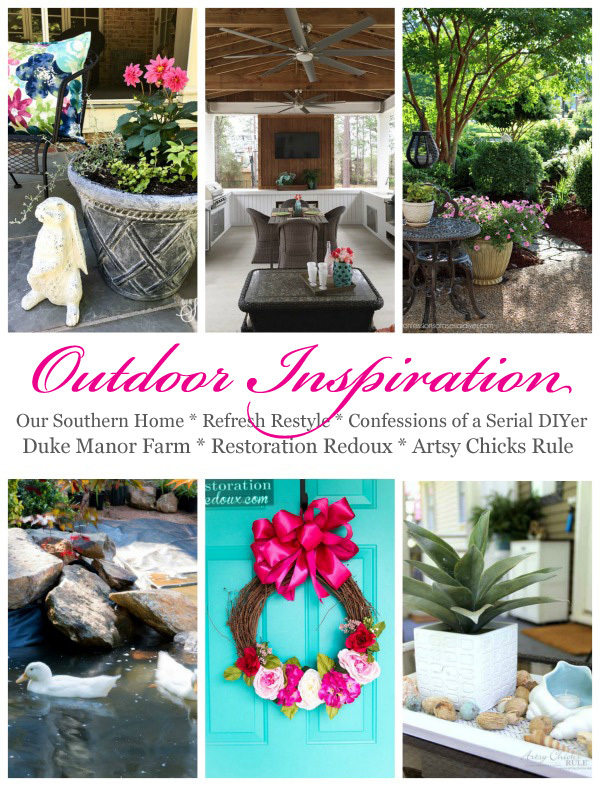 My Décor Enthusiast friends are sharing outdoor inspiration today as well! Ok, let me be the first to say how lovely and peaceful your garden is. I want to take my morning coffee out there!! Don’t mind me though, I won’t bother you as I get up early, but feel free to join me! Ha! Seriously, it is Beautiful, thanks for sharing it with me! Wow! So beautiful! Y’all did a great job! I love it!! I didn’t see the crepe Myrtle in the before picture, was it on a different location? 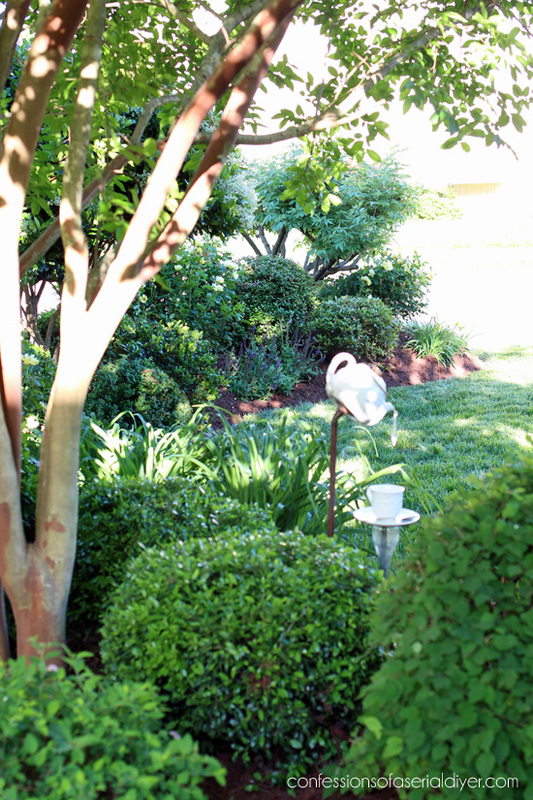 I love crape Myrtles and have several in my yard, but they don’t grow as fast as I’d like, and I need the shade!! Christy, you never cease to amaze me! What a beautiful, peaceful garden you’ve created. I LOVE the tea pot and cup idea. Now I think you’ve earned a day at the spa!! Thanks, as always, for your inspiration. I look forward to your posts!! 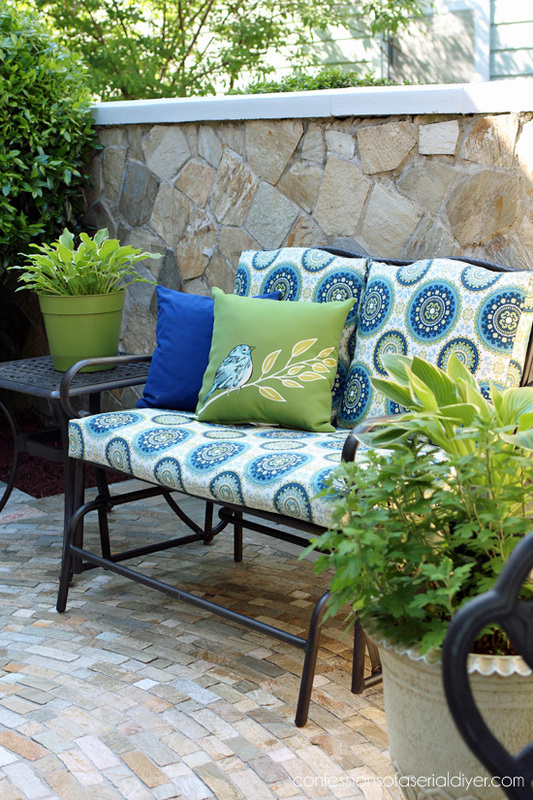 So enjoyed the pictures of your outdoor spaces. Just beautiful. Gorgeous house also. You talk about going from drab to fab, you nailed it. 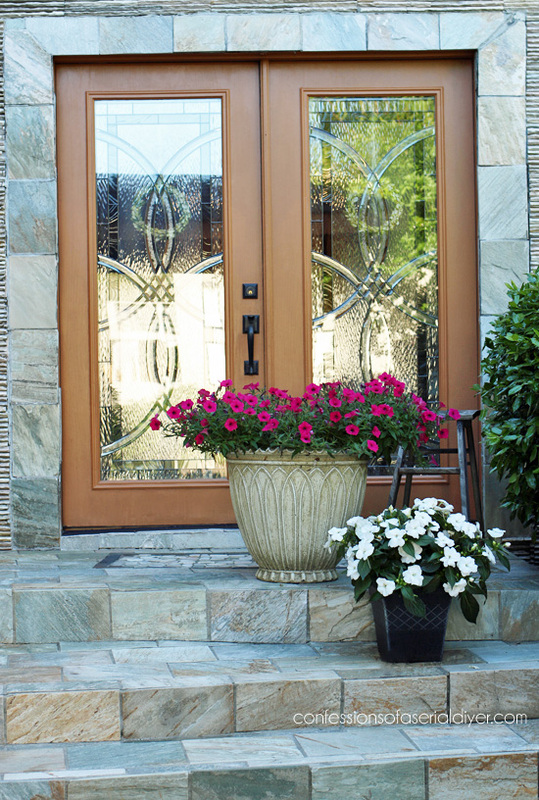 OMG I just love your home – and I just love coming to see what your newest project is. I only have a little townhouse but I try to incorporate some of your ideas to my own gardens and home. LOL Unfortunately, I’m running out of room. P.S. 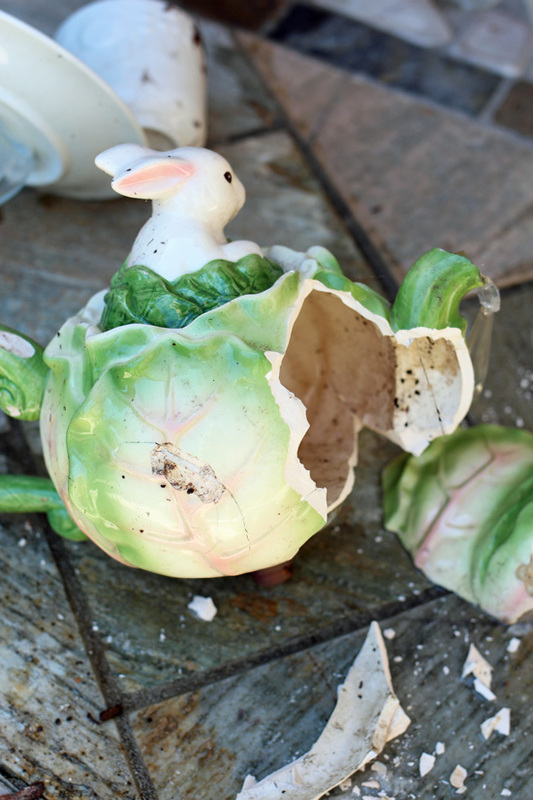 So sorry about the bunny teapot – he was adorable! Oh man, your landscaping is still THE BEST. I look up those posts whenever I need inspiration. GORGEOUS. 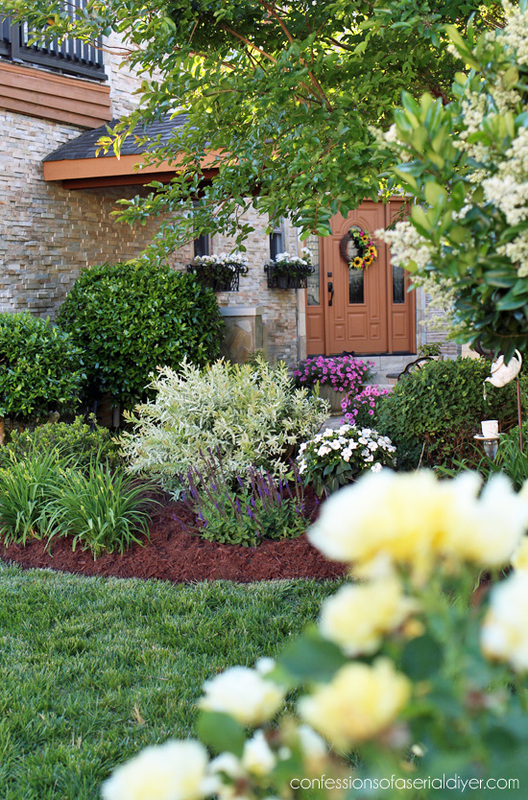 What a beautiful yard, Christy! As a fellow gardener, I admire all the work you’ve done. What a beautiful garden!!! I would love to sit in the glider with my favorite book and drink! Great job!! 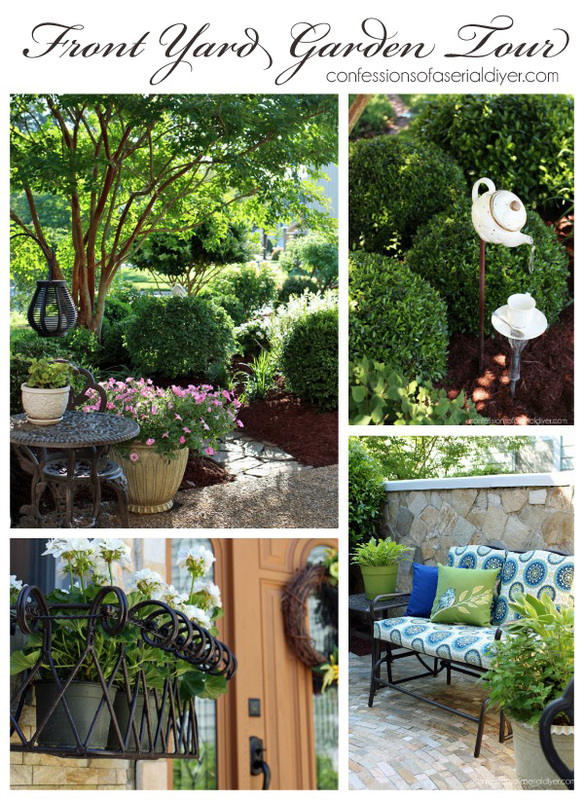 Christy, your yard is absolutely stunning, and I am loving all of these photos. Everything looks so inviting and makes you want to spend time there. 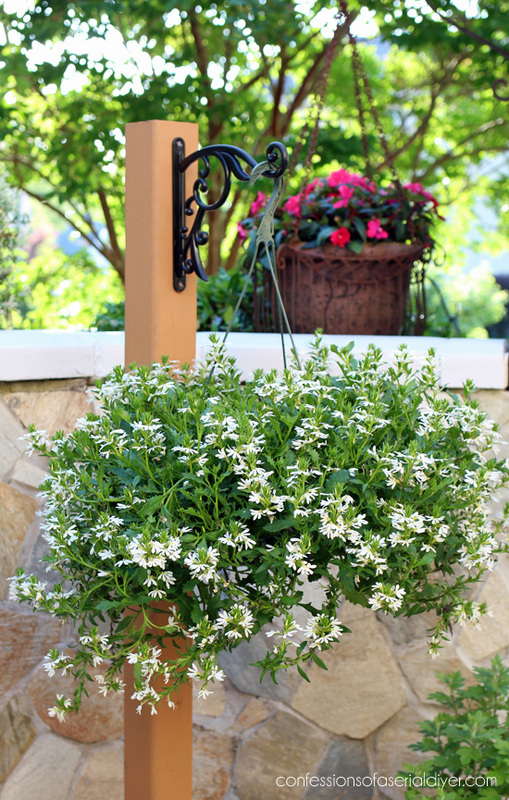 It would be very difficult to have a large number of potted plants here in Texas since the summer is so blazing hot and you have to water them every single day. 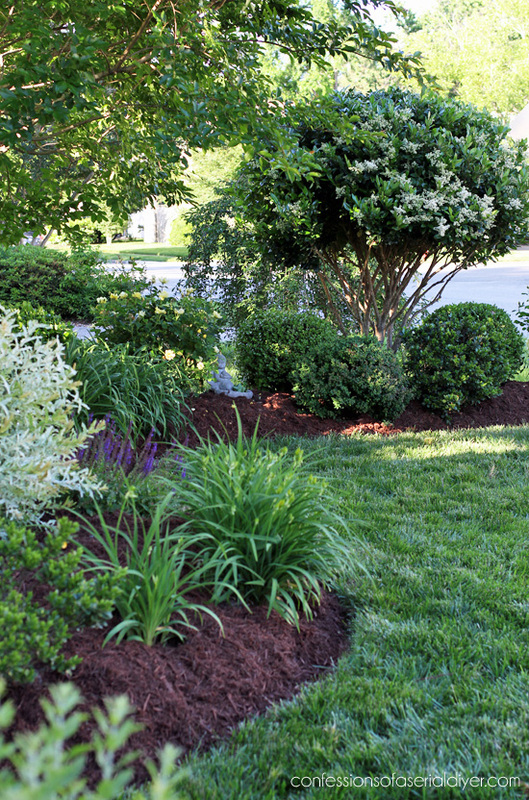 You’ve put a ton of work into your yard and should be very proud. Your home is really lovely. I love your garden in the front. 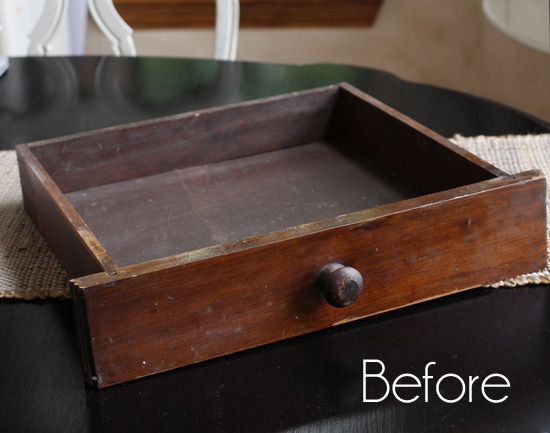 This blog is one of my favorites because you are able to envision how to make something old or dated into useful and pretty. I don’t have that ability, but I feel inspired to be creative and give myself permission to change things up in my own home. Best of all, your projects always look professional and are executed so well. Keep up the awesome work! This was a very fun post! Enjoyed seeing a ‘different’ side of your home. 🙂 It’s just beautiful, Christy… and so peaceful! Where did you get the bird pillow from? It’s adorable. And that wreath was a VERY good price! Good for you! 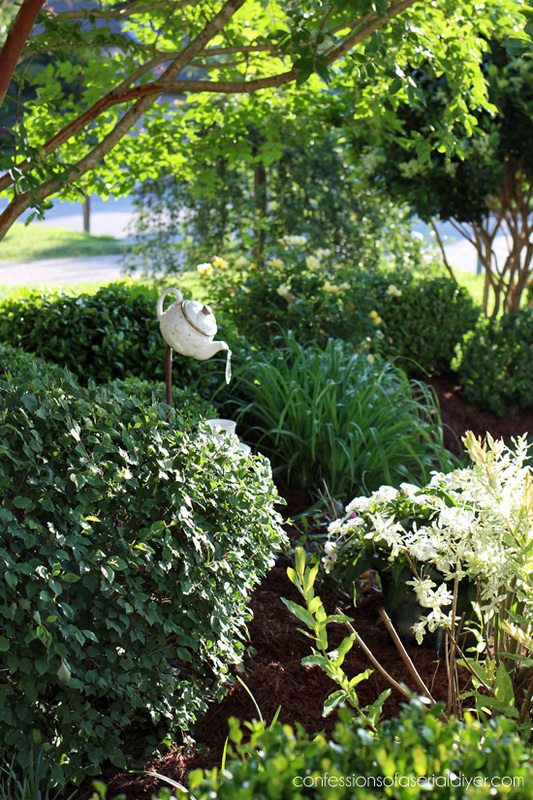 Oh, Christy, thank you for sharing your beautiful yard with us! It is gorgeous!!! 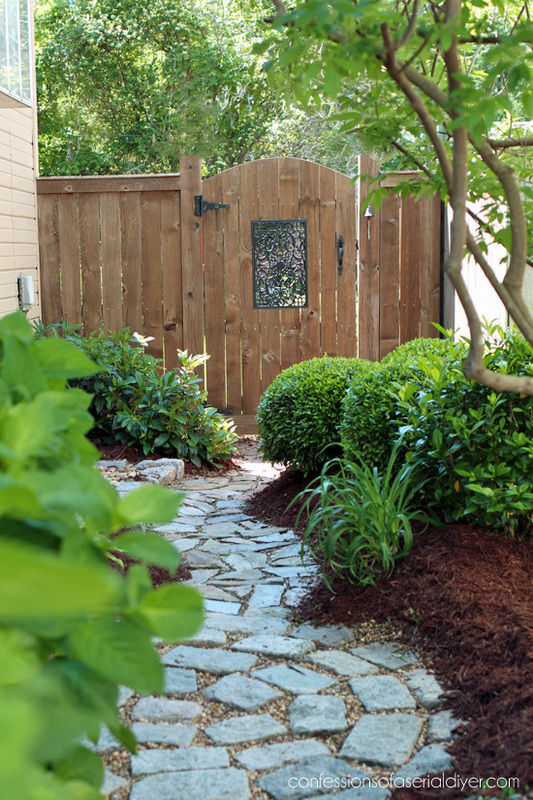 From the front door to the back gate, there is so much inspiration, and hard work that went into all of it. I love it!! Plus it has given me lots of ideas for my own yard and house. Thank you!!! Christy, you front yard is stunning. Love looking at all of your projects sprinkled about. i really need to follow your cushion tutorial! Thanks for sharing with us! 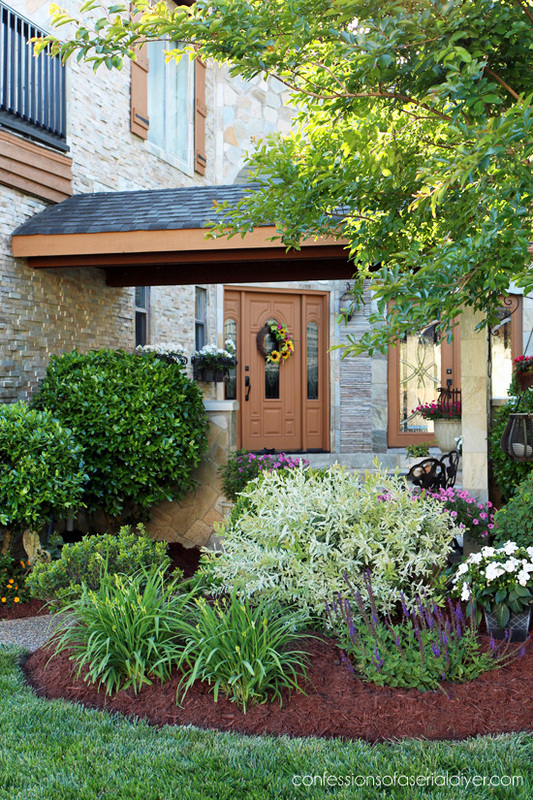 Now you have curb appeal! Definitely an improvement and i bet you enjoy relaxing out there now. 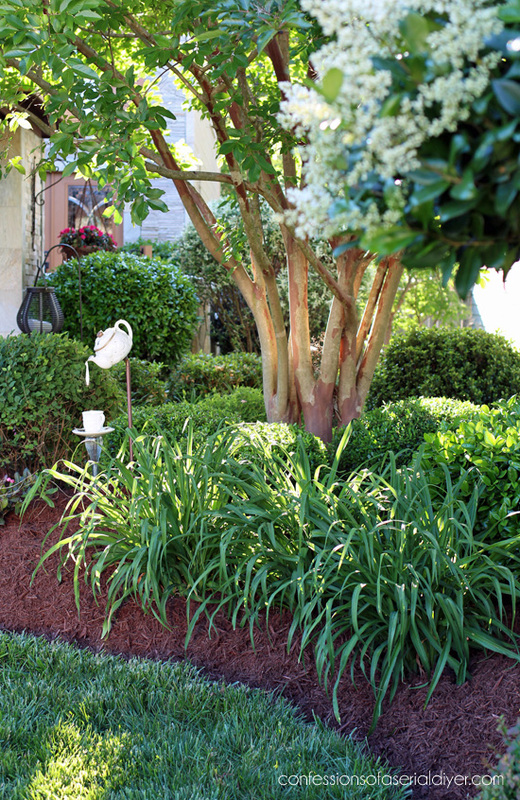 Your make over of your yard is just beautiful. You guys did a beautiful job! Your garden is beautiful. Just goes to show what a bit of know how and elbow grease can do. Love your blog. Although I have been reading about your projects for quite a while now,I have never made a comment before. It’s time to for me to say how inspired I am by every little thing you do! ( I have the Jungle Book song running though my head, I wanna be like you! ) 😉 I would love to be able to create and sell items full time, if my income would allow for it, I would be for sure. You have talent, girlfriend and I’m glad you share it with us. 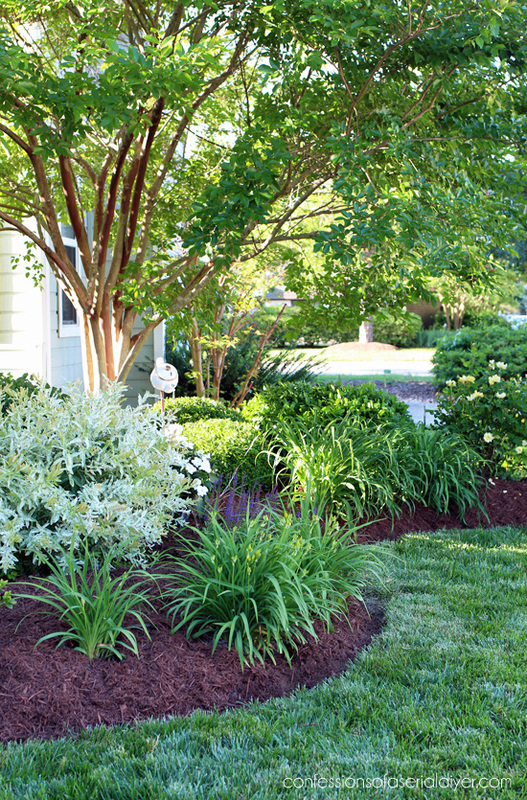 Your landscape gardens are lovely Christy :)It’s like night and day the difference from the before and after pictures! I especially love the teapot garden feature! 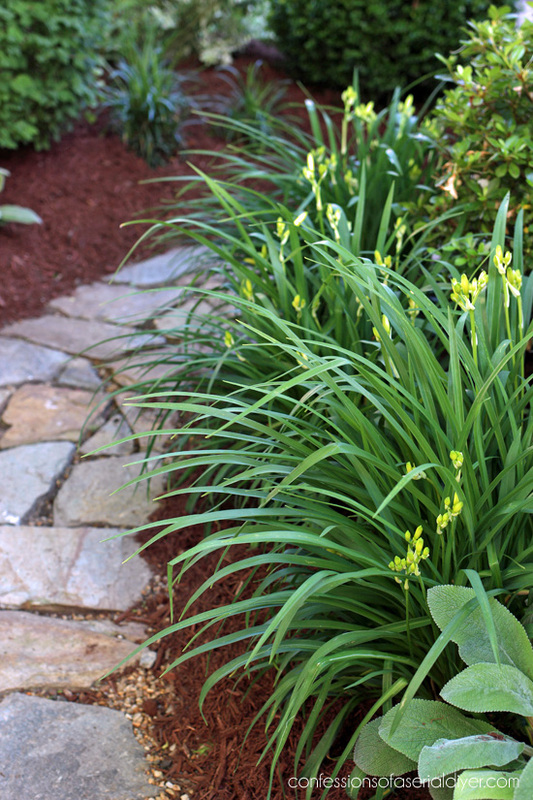 I am a gardener so I can appreciate all the work that space takes. It is just beautiful. I hate your precious little teapot broke. That was the first project I copied. 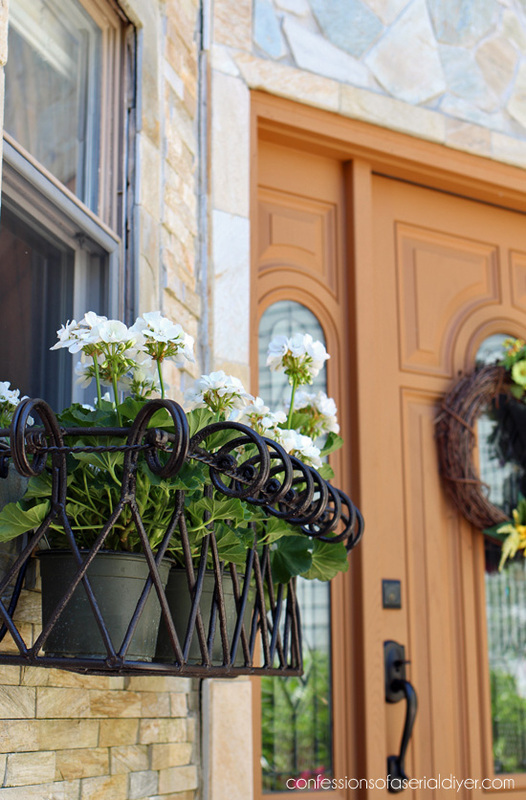 Stone walls, iron details (oh those perfect window boxes!) 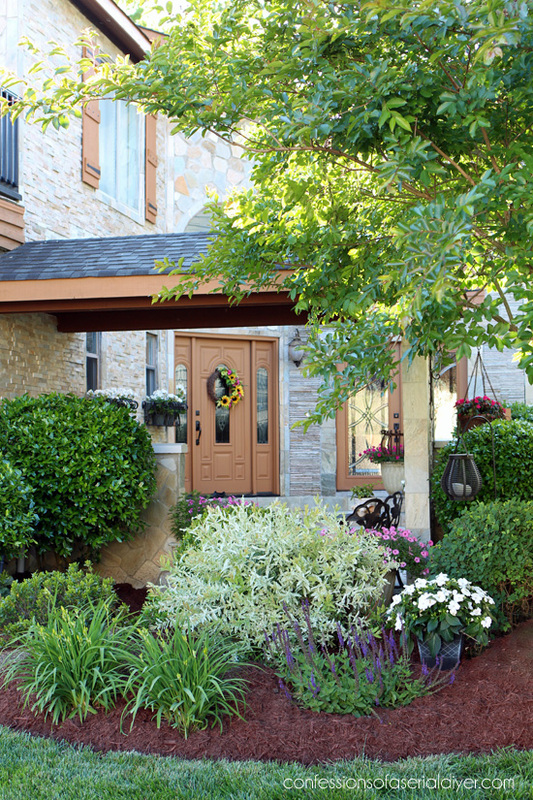 AND stunning landscaping? The teapot is adorable and placed just right. I love your landscaping posts. Your yard is so beautiful. I have read your post on how you started many times. I love to garden as well. It is work but so rewarding. 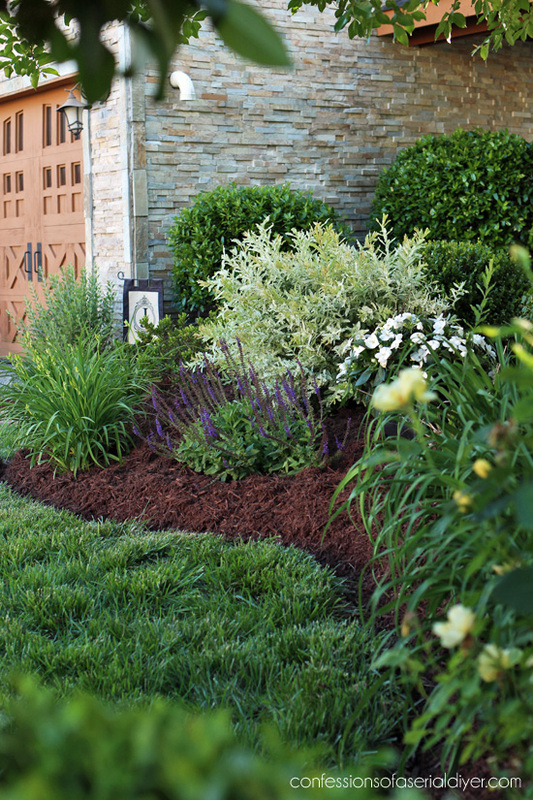 I love to see the freshly mulched beds in the spring. Great job! Absolutely gorgeous. You did a great job. Just found your blog and I will be following for sure. Oh Christy, what a beautiful and serene place to relax and get rejuvenated! Thanks so much. 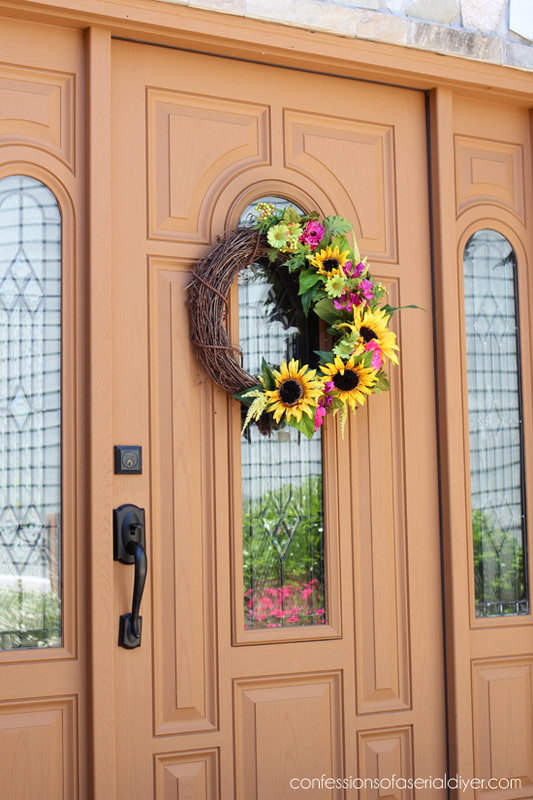 And I do love the color of your front door. What color is that and what type to paint? Hi Christy, I am a fairly new follower of yours & look forward to your posts. Your yard “remodel” has inspired me to get my front bed reworked. It’s been sad & bare for two years now due to my indecisiveness about what plants to use! When you can’t make a decision you just leave it alone! 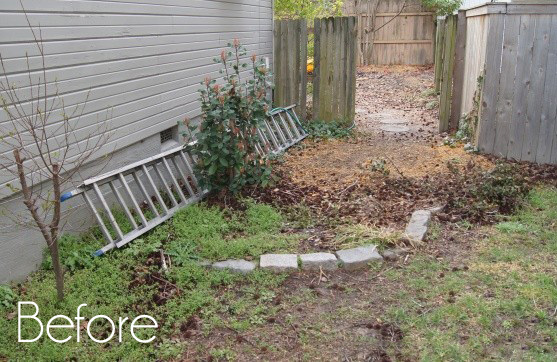 I love everything about your garden & little courtyard! Can you tell me what the tree is that is trimmed up high, & have some white flowers at the top? Thanks for all your inspired posts, but I think this garden is my favorite! Your yard is gorgeous!!! As is everything you do!!! I haven’t been commenting because the comments had been coming back “undeliverable”…..hope this one makes it!!! Thank you for your garden makeover. I’m in the process of redoing mine. I love flowers and green plants, but I’m trying to learn what works in Albuquerque and in particular my area of ABQ. Your pictures are beautiful.